Rainier hiking Van Trump day hike is for you If you're seeking a waterfall hike, with an option for a spectacular view of Mount Rainier. This trail description is based on numerous visits there. Keep reading for all you need to see and know about this Mt. Rainier day hike! You don't need a day hike pass. No pets or bikes are allowed on the trail. Enter Mount Rainier National Park through the Nisqually Entrance (Highway 706). The trailhead is approximately 11 miles "up the hill" toward Paradise. Don't stop at Longmire (mile 6) unless you need a quick pitstop or snack; it makes a better dinner destination after your long hike. Public restrooms are available, along with picnic tables if you're packing your own meal or a dining room open year round at Longmire Inn. There is a ridiculously small number of parking spaces. Part of the problem is that Christine Falls crosses the road, and many tourists want to park to snap a photo or two. There is no overflow or alternative parking, so if it's full, keep driving up the hill to a different trailhead. Or be proactive: get there early, early, early in the morning before the tourists have had breakfast. 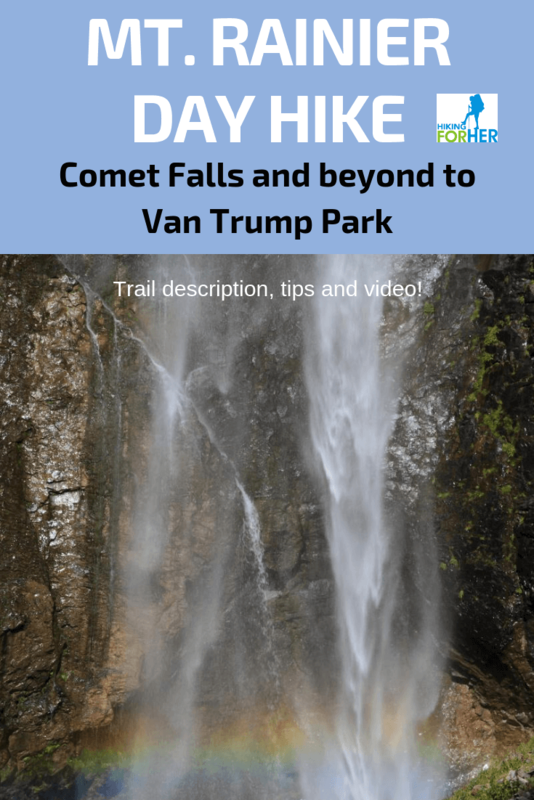 You'll gain around 1400 feet to Comet Falls, and an additional 600 feet if you trudge onward to Van Trump Park. The round trip distances are 4 miles and 6 miles, respectively. Fast hikers can get to Comet Falls and back in around 3 hours, but why rush? It's a glorious hiking destination, and if you snagged a parking spot, you've got all day! and breaks in and out of forest cover more frequently as you approach Comet Falls. There is a permanent crib ladder which must be climbed (and descended on the way back, of course) at 1.2 miles. Be glad it's there! Otherwise, the trail would still be closed from a landslide in that narrow area. Small children who like to run ahead (or are unsteady on their feet) might not be a good fit for this trail, as it is rocky and remains elevated a fair distance above the gorge for a long stretch. Not in a treacherous way, but enough to give a parent of toddlers pause. There is a bridge over Falls Creek just before you reach Comet Falls, which may be slippery. The rocks around Comet Falls may be drenched and slippery as well. No comets were discovered at this waterfall, but the long plunging tail of water is said to resemble that of a comet. Van Trump Park bears the name of P. B. Van Trump, who was among the first recorded climbers to bag the summit of Mount Rainier in August 1870. Rainier hiking Van Trump Park via Comet Falls gives you plenty of white noise from the rushing waters of Van Trump Creek until you reach the falls. The destination of Comet Falls will give you steady uphill work, but not overwhelmingly so. There are flat stretches to catch your breath in between the uphill sections. The falls are quite spectacular on a hot summer day. Imagine the cool mist drifting onto your face, washing away your sweat. And don't forget the rainbow at the bottom (see video above). If you really want to break a sweat, push onward on the right hand side trail past the falls, up to Van Trump Park. One mile of switchbacks gets down to business! If you hit it at the right time of year, the wildflower show will distract you. The chances of spotting marmots and pikas in the rocky Van Trump area are high. Mountain goats like to hang out on the rocky outcrops in between the Kautz and Van Trump glaciers. 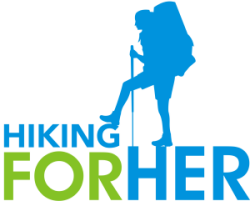 And your expansive views of Mount Rainier, Mount Adams, and Mount St. Helens will give you a huge hiking rush. If you reach Van Trump Park with plenty of energy left in your legs, you can continue steeply upward for half a mile or so, to Mildred Point. A jaw dropping close up view of The Mountain, and most likely, solitude. At 5800 feet elevation, the Kautz Glacier is going to fill up your senses with raw power: falling rock, cold breezes, sunlight glinting off glacier melt, and more. It's a busy trail to Comet Falls, and gets progressively less busy with elevation. and a bonus spot for gawking at Mount Rainier. More great Mount Rainier day hikes for you to explore: photos, trail descriptions and video!